We have finally come to the final story in Genesis of Joseph. This story will leave the people of Israel – the descendants of Abraham and Sarah in Egypt at the end and get us ready for the stories in Exodus. But for now, let us remember that way back at the beginning of the cycles, in chapter 12, God spoke to Abraham and gave him a promise: 1. You will be a great nation, your descendants will be as numerous as the stars (repeated in chapter 16); 2. I will be with you and will bless you unconditionally; 3. All of this so that you and your descendants might be a blessing to others. Then we saw how the stories that followed focused on and worked through this promise. The stories of Abraham, Sarah, Hagar, Ishmael and Isaac all centered around the 1st part of the promise, securing an heir to carry on the promise. The Jacob, Esau, Rebekah, Laban, Leah and Rachel stories all focused on blessing, and the basic mistrust that all these characters had in God’s promise of unconditional blessing, which leads them to acts of betrayal. Finally we have come to the Joseph cycle, and now the future is secured – the descendants of Abraham and Sarah are now plentiful, the issue of blessing has been resolved and we come to the final part of the promise – so that you might be a blessing to the nations. And so chapters 37 through until the end of Genesis in chapter 50 will show us how this family is able to be a blessing to the nations, preventing famine and starvation. But not through any direct effort on their part, but rather God uses them in this way despite their self-centered behavior. When we first meet Joseph he is a spoiled brat. He is his father’s favorite, not only because he is almost the youngest (his baby brother Benjamin is actually the youngest). But he is his father’s favorite because he is the first son of Jacob and Rachel, and Rachel is now gone, having died giving birth to Benjamin. (Note – despite the popular Weber/Rice Musical, Benjamin is not a part of the events in the first part of the story, he is only an infant or toddler). Now, you would have thought that Jacob might have learned his lesson, after all he was his mother Rebekah’s favorite and his twin Esau was his father Isaac’s favorite and this favoritism drove a wedge between these boys and led to much suffering. But Jacob seems to have learned nothing for he is repeating the pattern. 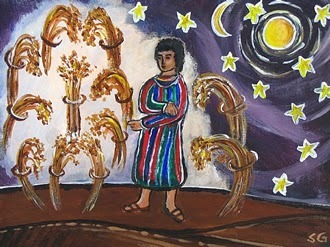 He dotes on Joseph even goes so far as to give the boy a special long-sleeved ceremonial robe (the “coat of many colors,” which is how it is described in the Greek translation of the Old Testament – the Septuagint). For his part, Joseph flaunts this favoritism. He is a tattletale, he has these dreams where he is ascendant over his brothers and he brags about them, he wears the robe everywhere. And his brothers hate his for this. And so, one day the brothers can take it no longer and they resolve to murder their brother, though eventually they see an opportunity to profit AND get rid of Joseph at the same time, so they sell him to Ishmaelite traders (do you see the irony here – Ishmael is actually Joseph’s great uncle, who was driven away by his great grandfather Abraham when Abraham decided to favor Isaac). And the traders take Joseph to Egypt where he is sold to a court official named Potiphar as a slave. The brothers then take the hated robe, rip it up and dip it in the blood of a goat and tell their father that a wild beast has killed Joseph. End of problem! Well, not exactly. For the brothers still have to learn the hard lesson that Shakespeare teaches us in the play “Macbeth” – murder (even a faked murder in this case), betrayal and deception changes everything! Life will never be “normal” again. The grief of the father is overwhelming and will not abate, and this changes the relationships among the family forever. Before he is sold the brothers jump Joseph, strip him of his robe, rough him up and throw him into a dry well – into a deep pit. This pit then becomes a central symbol for the rest of the story. The pit represents alienation, depression, darkness, brokenness and imprisonment. And there are lots of pits in this story. 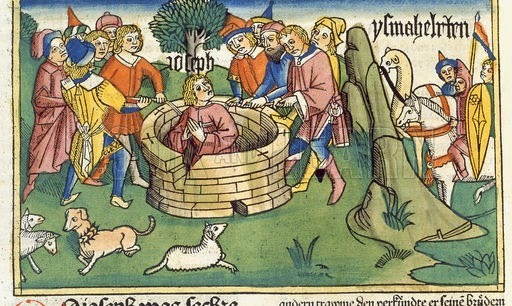 Joseph is thrown into the pit and then pulled out of it only to be sold as a slave (another pit!). Eventually Joseph will again be thrown into the pit of the dungeon where he will languish for a while. There he will meet others – a baker and a butler – who have also been thrown into the pit. But the ones who find themselves in the pit for the longest time in this story are the brothers and Jacob. For Jacob is in the pit of his own grief and he cannot climb out of it. He is in the pit that he, at least in part, dug himself and he will eventually come to see this. The brothers have also dug themselves a pit. Through their murderous and callous betrayal of their own brother they find themselves in a pit that they cannot escape from. Only Joseph can pull them all out of this pit. And that won’t happen for a while. In the meantime, they exist and discover that nothing is as it was, and that joy has gone. Life in a pit is not an uncommon experience. We have all experienced this, and perhaps we are still experiencing it. Sometimes, like the brothers or Jacob, the pits are those that we have dug for ourselves and we cannot manage to pull ourselves out of them no matter how hard we try. Sometimes, like Joseph we find ourselves fallen into a pit and cannot find our way out. These pits of ours can be a variety of things – a traumatic event; a bad decision that has had far-reaching consequences; an act of selfishness or of unkindness or hate towards another; a slow disintegration of a relationship. Sometimes the pit can be things out of our direct control – economic or money concerns; health problems and worries and on and on. We can all identify any number of pits I suspect that we find ourselves in or have found ourselves in, and from which we need to be freed. But God does offer us freedom and liberation from the pits we find ourselves in. Often this freedom does not usually take the shape of having the pit just disappear for usually we need to look at ourselves seriously and honestly and take responsible steps in order to move ourselves forward. But God still offers us freedom, and a way out of the pits. In the Gospel text, Jesus tells his incredulous disciples that picking up the cross is the way to find freedom, and grace. This is not what they want to hear. They want Jesus to just take care of it for them. They want the pit to just melt away, but no Jesus makes it clear that it is not so easy. God’s love is constant, God’s blessings are constant, but we have responsibility and an obligation. We have to take responsible steps forward. God will not just zap the problems away and make everything better through a wave of the hand. The cross itself reminds us of this. And so, as we pause here in the story wondering what will come of poor Joseph, and his father Jacob and his brothers – especially little Benjamin – it is good to for us to think about the pits in this story and take stock of the pits we find ourselves in. And then look to Jesus and the cross and ask for healing and strength, wisdom and determination, trusting that God’s love, grace and presence will provide us with these gifts that will help us get out of the pits.